In the right room, installing crown molding can create a dramatic impact. The finishing touch of molding enhances a room the way the right frame accentuates a painting. Crown molding installation takes some special tools and time, but the effort is well worth it. There are two basic ways to cut crown molding. You can utilize a miter saw, which has no blade tilt, prop the crown molding up against your fence and set the miter angle. This technique is referred to as "upside-down and backwards." Alternatively, you can use a compound miter saw and lay the crown molding flat and face up. You will then set the miter and blade tilt adjustment. Place the crown molding on the left side of the saw and turn it upside down. Press the crown against the fence on a diagonal (the bottom should be flat against the fence while the top lies on the cutting plane, forming a right-hand triangle). Angle the saw 45-degrees to the right. Turn the saw on and place it over the area where you want to make the cut. Push the saw downwards and away from you. For the right side of the outside joint, follow the same instructions but place the crown on the right side of the saw instead of the left side. For the right component of the inside joint, place the crown diagonally on the right side of the saw. Swing the saw 45 degrees to the right and make the cut. The left component is created in the same way, but place the crown diagonally on the left side of the saw. Draw a diagram of your room, and measure each wall twice. Shop for molding pieces that are as long as each wall. 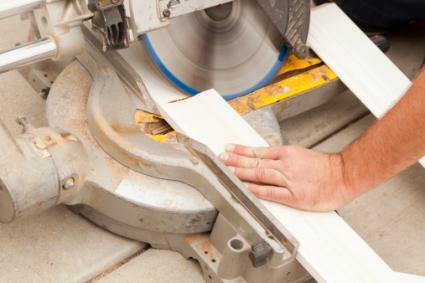 When selecting boards, check for nicks, tone variations and blemishes that can't be easily sanded out. Have the assistant at the home improvement store make your general cuts for the length of strips you need, but not the angled cuts. Set up your workstation within the room for better flow. Locate and mark the studs on the wall. Practice a few angle cuts on scrap wood to test measurements and get the feel for the saw. Tack molding scraps into the wall/ceiling seam to determine the placement, snap a chalk line, and run painter's tape along the wall as a positioning guide for the molding's bottom edge. Start on your longest wall and work to the right. Some experts believe this is easier because you can set the miter saw to the left and have a better view of your measure marks for a more accurate 45-degree cut. Before cutting, take care that the mark matches the direction of the miter. Coping is a lot easier if the miter cuts are accurate. Coping permits two pieces of molding to fit together at a corner. If you're off by a little bit, shave off the extra with the miter saw. The coping saw is more for fine work. Set the boards along the wall/ceiling seam against the tapeline and secure where the studs were marked. Scrap away rough corners with a utility knife, fill with wood putty, then sand. Prepare molding for painting or staining. 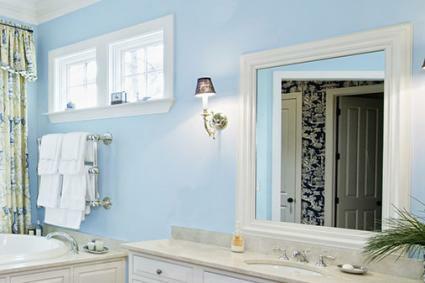 For more information on installing crown molding, visit the website for "This Old House." General contractor Tom Silva explains the nuances of the project and how to cut the corners right. 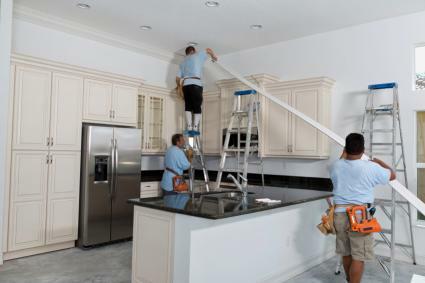 The DIY Network offers an installation tutorial for kitchen cabinet crown molding. The manufacturer of Cut 'N Crown offers a demo of its product and how it makes installing crown molding easier. A woodworker's website, Alter Eagle, which includes a tutorial, videos and plenty of tips. Crown molding comes in several varieties and can be used in many areas. Homeowners most often use decorative trim made from milled or reformed wood. Crown molding is also manufactured from other materials, including plastic, plaster, pressed foam and sometimes, simply for a faux effect, a paper stock that's easily painted. Pine, spruce and poplar are easier woods to work with than oak, and less expensive. As an accent above a fireplace, window or entryway. As a framing device for a special architectural detail, such as a cabinet or alcove. This trim is not attached flush against the ceiling or wall, but rather inserted into the angle where the ceiling and interior wall merge. The broad wave at the top of the piece is known by the classic architectural term, cyma recta, which means "upright" or "wave." This portion is also called the ogee. During installation, this end is closest to the ceiling. The decorative strip that gives the molding its character is the dentil. Most of the time during installation, this piece is on the bottom. Some installers combine different crown accents with an ogee, a dentil and a thinner piece of trim to use as a rail. Crown molding can bring a brand new look to any room of your home. Take your time, practice all of your cuts on a spare piece first and in no time, you'll be enjoying the greater depth of detail the crown molding brings to your home.